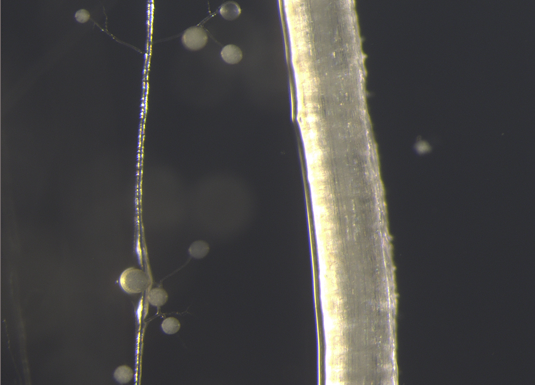 Textbooks tell us that, in arbuscular mycorrhizal symbioses, the host plant supplies its fungal symbionts solely with sugars, in return for inorganic nutrients. New findings by LMU researchers now show that lipids are also on the menu. More than 80% of all land plants live in so-called arbuscular mycorrhizal symbioses with fungi that colonize their root systems. The fungi take up inorganic nutrients from the soil – mainly phosphate and nitrogen – and pass them on to the plant. According to the prevailing view, the host provides its benefactors with energy-rich organic compounds – specifically carbohydrates – in return for this service. The research group of LMU biologist Caroline Gutjahr, in collaboration with research groups led by Peter Dörmann (Bonn University), Wolfgang Eisenreich (Technical University of Munich) and her LMU colleague Martin Parniske, has now shown that the plant contributes more than just sugars to the relationship: It also delivers essential lipids to its fungal partner. The new findings appear in the prestigious online journal eLife. Lipids, i.e. fatty acids and their derivatives, are indispensable for the formation of biological membranes and also serve as energy storage compounds. As such, they are crucial for the survival of all organisms. “However, recent work has shown that at least some of the fungal partners in arbuscular mycorrhizal symbioses lack the genes for enzymes involved in the major pathway of lipid biosynthesis, and are therefore unable to produce certain essential fatty acids,” Gutjahr explains. “In our study, we used two mutant strains of the model plant Lotus japonicus to investigate whether the host plant actively makes up for this deficiency.” L. japonicus is a member of the Leguminosae, the plant family to which clover, peas, beans and lentils also belong. Each of the mutants isolated by Gutjahr‘s team is defective in a gene that plays an important role in the synthesis of fatty acids and phospholipid biosynthesis. Strikingly, these strains harbor significantly lower amounts of mycorrhizal fungal colonization than their wild-type counterparts. In particular, the highly branched tree-like fungal structures, called arbuscules, normally found inside cells of the host root – which are required for nutrient exchange – remain underdeveloped. Comparative analyses of the range of fatty acids and lipids present in the infected roots of the wild-type and mutant hosts revealed that certain fungus-specific fatty acids are either missing or their levels are drastically reduced in the colonized roots of mutant L. japonicus strains. “This suggested that fungal symbionts that colonize plants which are deficient in lipid biosynthesis suffer from a lack of essential lipids,” says Andreas Keymer, a PhD student in Gutjahr’s group and first author of the new study. Subsequent labeling experiments using the stable carbon isotope 13C demonstrated that wild-type L. japonicus hosts indeed directly provide the fungus with the required lipids. In other words, these are not synthesized by the fungus from the carbon skeletons of the sugars delivered by the host. The researchers assume that the fungus utilizes the lipids from the plant primarily for the rapid growth of the extensive and highly ramified hyphal networks outside the root it uses for the uptake of minerals from the soil. Also spore formation requires large amounts of these compounds probably because the spores need to store lots of lipids to support new germination and growth of fungal filaments (hyphae) that first need to reach a new root before they have access to plant lipids again. Gutjahr and her team will now focus on elucidating how the lipids synthesized by the plant are transported to the symbiont. “In addition, it is also important to determine the ratio of sugars and lipids made available to the fungus,” she says. Since lipid synthesis is more costly than carbohydrate production, this parameter has a bearing on the total amount of energy invested by the plant in the maintenance of the symbiosis. A better understanding of the role of lipid biosynthesis in this type of symbiosis could therefore help to select host plants that can make optimal use of their relationship with their fungal partners, which can be a benefit to sustainable agriculture.